Local young football team “Gold Coasters’ are doing well in The Hong Kong Football Association’s youth football leagues and cups. The HKFA operates divisions at 3 age groups U18, U16, and U14. All divisions are named the ‘Henderson League’. Last season Jordan Jarvis and William Grierson played for South China in the U16 division and Mark Swainston played for the newly formed Kowloon Rangers in the U14 division. 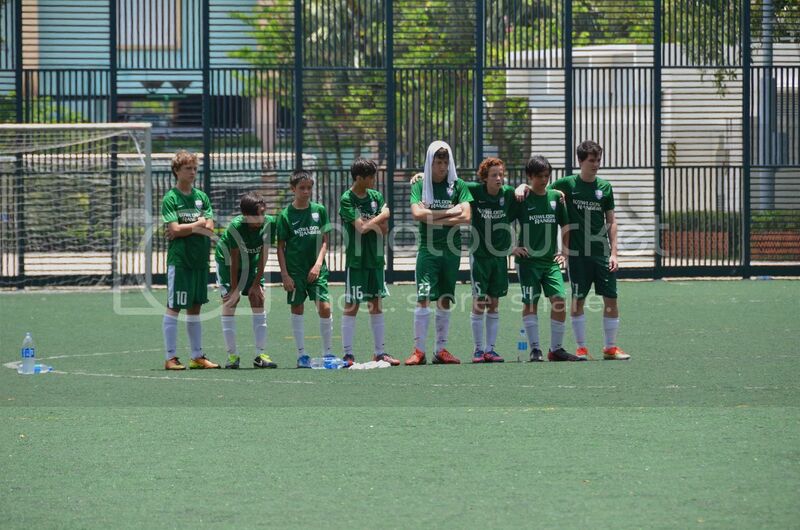 Kowloon Rangers U14 fared better. They finished 2nd in their qualifying group which easily qualified them for the Elite Cup League. Kowloon Rangers as a club have the biggest connection to the Gold Coast. The team is made up of players from 3 clubs namely Kowloon Cricket Club, Hong Kong Dragons, and Asia Pacific Soccer Schools (formerly Brazilian Soccer Schools). Jordan, William, Mark , Andrew Grierson, (William’s brother ), and Ryan Jarvis , (Jordan’s brother) have all progressed through the ranks at Brazilian Soccer Schools , attending training sessions at the Gold Coast Hotel tennis courts every Wednesday since they were 8 , and gaining selection to the squads to represent BSS in the local Junior Football Saturday League. The BSS squads train at Kings Park every Friday and are selected from BSS training ‘camps’ all over HK. The HK Junior Football League is not affiliated to the HKFA. For some reason the HKFA do not have many organized competitive games for youngsters under 13, probably choosing to concentrate on school events instead. 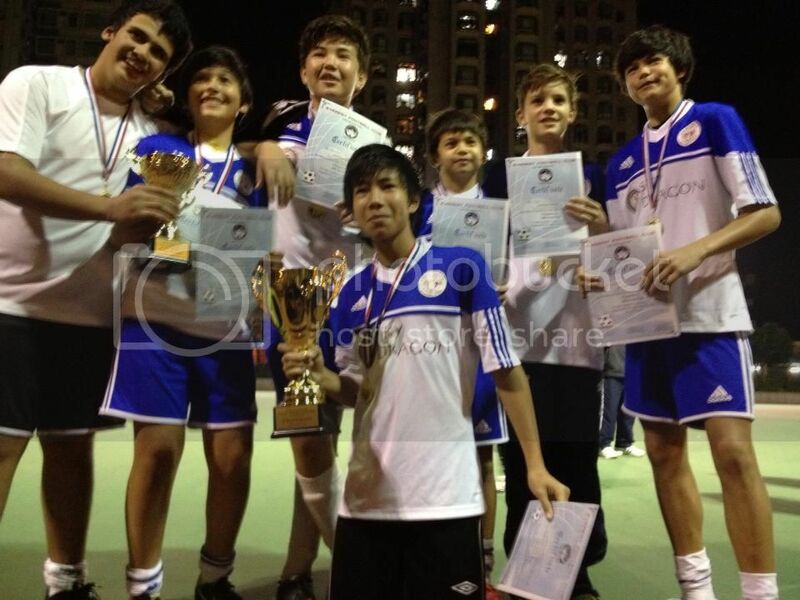 All the boys mentioned above have represented BSS over the last few years in the HKJFL. In addition they have been selected to represent HKBSS in international tournaments in Bangkok, Phuket, and Borneo. Jordan and Mark have attended the prestigious APSS football training college in New Zealand. The HKJFL will expand next season to welcome in new teams and provide competitions to older age groups. Previously U14 was the ‘oldest’ league. Kowloon Rangers finished 3rd in the U14’s Elite League which was a very credible achievement given this was their inaugural season. The other teams were well established having competed in the Henderson League the previous season when it was U13 and many being the youth teams of the top HK 1st Division teams such as Kitchee , South China, Biuchun Rangers ,and Yokohama. The Henderson league games for the U14s are played Sundays. 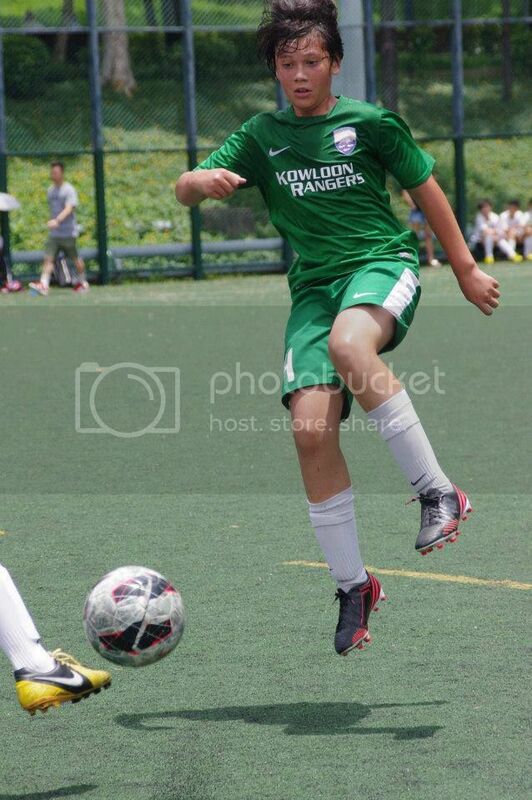 Mark had played for HK Football Club in the U13 Henderson League the previous season. Football Club finished runners up to Kitchee that year and then lost to Kitchee in the semi final of the Cup. There were only 3 other Kowloon Rangers players with Henderson league experience that started the 2012/2013 season! So to finish 3rd was a superb achievement. Yokohama won the U14 Elite league and HK Football Club finished 2nd. Kitchee could only manage 5th!! 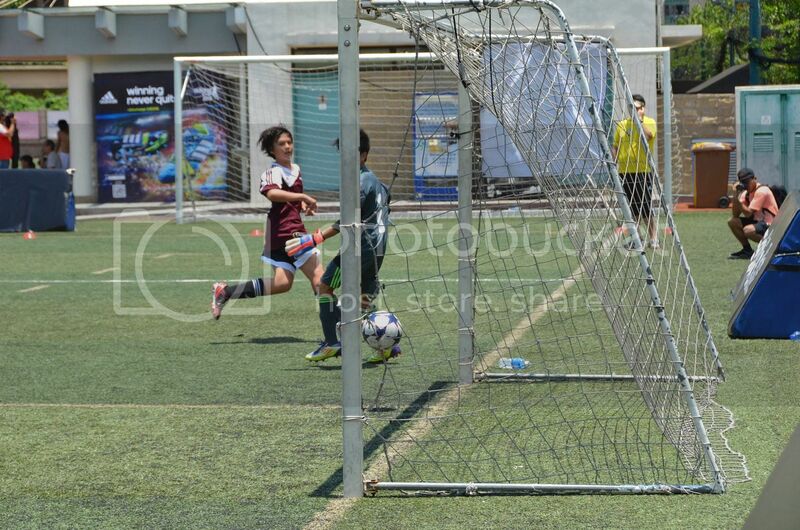 In the U14HKFA Cup that followed on from the finish of the league. Rangers progressed to the semi final to play Football Club. It was a meeting of old friends for Mark but that was all forgotten when the game began. The tie was played in blistering heat at midday! It finished 1-1 and went to penalties. The penalty shoot out was impressive. All the 1st 5 players on both teams scored, Mark took Rangers 2nd penalty , It then progressed to 8-7 in Rangers favour with all penalties being scored before the next Club player hit the bar with a pile driver that came down bounced on the line and out, a la Geoff Hurst , but with no Russian linesman it was a miss and Rangers were in the final. The Final was against Yokohama. Yokohama are also a new team to the Henderson League but they are the youth team of a HK 1st Division club and are sponsored by Chelsea FC!! Yokohama actively recruited all the best local U14 HK Youth team players including the U14 international goalie,who is 6 feet tall. The final again was played at midday in searing heat! It wasn’t the prettiest game to watch but Rangers battled hard and arguably played the better football. They scored a well worked set piece from a corner and it was 1-0 going into injury time. Three minutes into injury time and the ref gives a free kick to Yokohama just inside Rangers half. All Yokohama including the 6 foot goalie encamped in the Rangers half. The ball is belted up into the air it lands on the top of a Yokohama players head and bounces up into the air again coming down just under the Rangers cross bar. The Rangers goalie does well to palm it onto the bar but it dropped down to a Yokohama player who boots it in, 1-1 !! Penalties again. Mark takes the first and scores. It gets to 3-2 in Yokohama’s favour before their goalie shows just how good he is and pulls off 2 excellent saves. It was hard to bear for the team who had all played magnificently and did not deserve to be on a losing side. In addition to the heroics of the Henderson Leagues and the HKJFL the local boys have also been excelling themselves as the ‘Flying Piglets’ the youth section of the Gold Coast Flying Pigs Football Club ably run and managed by Dave “Casper” Lawrence. The boys mentioned above plus more Gold Coasters Siggi Bjoerhovde and George Billinge, in goal, have played three 6 a side games against the HK Nepalese U15 team and won them all. Paul Foster is the coach. The first 2 were played at the GC Flying Pigs tournament at Phase 2 pitch in April and were both 1-0 wins. Siggi and Mark getting the goals . The third game was at the Nepalese community HK football competition at Yuen Long. This time the score was 2-0 . Mark and Siggi scoring again. This was no mean achievement as all the Nepalese boys were 14 years old whereas the ‘Piglets’ had Jordan and William at 14, Andrew George and Mark at 13 and Ryan and Siggi at 10 or 11! ‘Casper’ is looking into getting a few more ‘friendly’ games for the boys next season. If any want to ‘try out’ they should come to the Phase 2 pitch on a Sunday between 2 and 4 pm. Jorja Townson and Jenny Swainston G.C. girls play for Kowloon Cricket Club at U12. They are coached by Jorja's Dad Adrian. Reports on their games can be found on KCC website. www.kcc.org.com. The games are 6 or 7 aside. The U12s went on a wonderful streak where they did not concede a goal in 3 competitions, winning 2 and losing the other on penalties in the final!! They are the team to beat. Jorja plays attacking midfield and Jenny is defence. Both are first names on the team sheet despite being only 10. Keila , Jorja's sister plays for the U14s . Their winning run in local competitions is even more impressive. Keila is one of the top players and has been invited to train with the HK squad. Next season Keila and others from the U14s will play in the local HKFA 11 a side ladies league for the newly formed KCC ladies ! Adrian is to be the Manager. On a final note George stepped up and played in goals for APSS with Mark in the Adidas Cup 7 a side U15s The Adidas Cup is open to all HK youth teams and is eagerly anticipated as they win dosh! Well, sports vouchers! Jordan got to the semi final one year with BSS and got over $2,000 in vouchers! Jordan and William both played for South China . 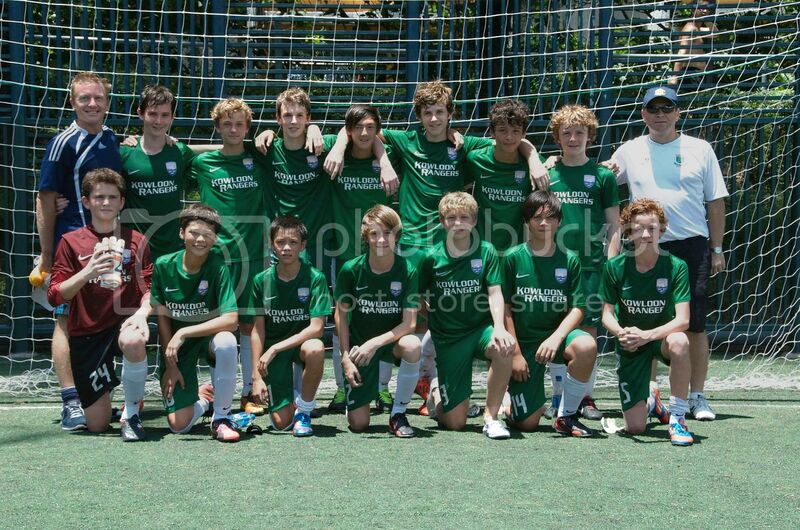 The APSS team were all U14s and so did very well to get to the quarter final beating Yokohama on the way! The QF was played only 20 minutes after APSS had beaten Yokohama and was against the eventual tournament winners and was at midday in searing heat! The score was a lot-0. The boys just didn’t have anymore to give. George made a brilliant save onto the bar but it bounced out straight to their man for the opening goal and no matter how hard they tried APSS couldn’t get enough of the ball. George enjoyed himself and will be trying out for APSS and Kowloon Rangers full time next season. APSS web site is at www.apsoccer.hk. They have their own face book page as does Kowloon Rangers. APSS coaching sessions are at the Gold Coast Hotel each Wednesday early evening during school term.5 - 7 year olds play from 5.30 - 6.30 p.m., and then 8 - 13 years olds play from 6.30 - 7.30 p.m.You can find the application form here. APSS also run Kinder Kick coaching sessions for under 7’s at the Phase 2 pitch on Saturday mornings.